An over-plotted but often creepy low budgeter, associate produced by future Troma honcho Lloyd Kaufman. Its festive backdrop, eerie use of Christmas carols, threatening phone calls and subjective camerawork may have been an influence on the far more beloved BLACK CHRISTMAS. Solemnly narrated by Mary Woronov to the tune of a downbeat “Silent Night”, it involves city lawyer Patrick O’Neal and his Euro-babe squeeze spending a night at a notorious haunted house while he closes the deal on the house sale. There’s a mystery asylum escapee on the loose and various townsfolk are receiving whispering, eerie calls luring them to the house. Cluttered with red herrings and a lengthy asylum flashback sequence (showcasing a broken-bottle eye gouging from the victim’s p.o.v), this pulls off its biggest shock half an hour in by bloodily killing off its top-billed star in a moment of axe-whacking frenzied violence. 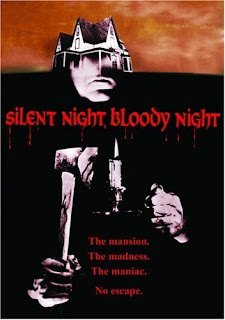 It anticipates many of the clichés of the later slasher cycle, and features a typically fine Woronov as a self-described “pushy”, independent, gun-toting early final-girl.